After thirty-five years participating in juried competitions throughout the United States and Europe, Barry and Rosalind Hage decided to share their love of clay by teaching classes. Barry taught undergraduates for four years at UCLA while pursuing his MFA in clay and glass. Upon graduation he taught at Cerritos Community College. In 1973 he began a full time career as a studio artist. Rosalind taught elementary school at Garden Grove Unified for eleven years. In 1981 she joined Barry in the studio. Beginning classes will teach hand building with no more than five students per class. Private classes in wheel throwing will be available to students with basic clay experience. Contact Barry and Rosalind Hage at 562-491-0647 or email rosalindhage@yahoo.com to register and for required materials. Let the fun begin! Due to our tight show schedule…no make-up classes. 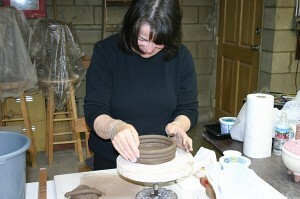 Fees: $250.00 includes three four-hour classes, one bag of clay, glazes, tools and all firings.